X-bit Labs delivers news that later this summer, Nintendo will start shipping a new 3DS handheld console with a larger screen. The new 3DS XL model offers a 4.88" top screen and 4.18" lower screen, versus 3.53" and 3.02", respectively, on the original 3DS. Additionally, the new model also comes with a 4GB SSD memory card installed and offers more battery life thanks to a larger battery. Just weeks after denying possibility of launching any new versions of its 3DS portable game console, Nintendo announced that it would begin selling 3DS LL (for Japan) and 3DS XL (for Europe and U.S.) devices with substantially enlarged screens late in July in Japan and in August in the U.S. and Europe. The 3DS XL/LL portable entertainment device will appeal to those who want to have better gaming experience on bigger (4.88" and 4.18") screens as well as for those looking for longer battery life. The novelty will come with 4GB SD card installed, making it better for downloadable content compared to its predecessor. Most importantly, the new enlarged consoles will not be significantly more expensive than predecessor (3DS carries $169 price tag in the U.S.): the 3DS XL will cost $199 in the U.S., while the 3DS LL will be priced at ¥18900 ($235). 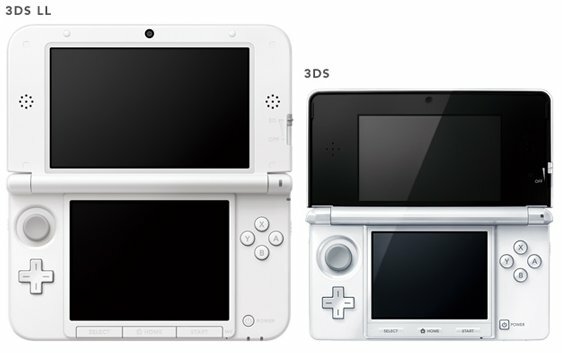 The 3DS XL measures 93mm x 156mm x 22mm and weighs 336g, considerably more than the 235g of the 3DS.